NINE months after playing for Conference North Workington, Carlisle United goalkeeper Adam Collin booked his place at Wembley with his penalty shoot-out heroics in last night’s Johnstone’s Paints Trophy Northern Area final. Collin saved from Shane Lowry to set up a Wembley date with Southampton on March 28. Leeds, missing injured ex-Carlisle loanee Jermaine Beckford, scored twice in the final 10 minutes just as it seemed Carlisle had booked their place at Wembley. But former Newcastle United trainee Collin, who also saved from Bradley Johnson, dived left to keep out Leeds’ seventh spot kick. What made it even more special for Collin was the fact understudy Lenny Pidgeley had been chosen for the previous two games in the competition. “I found out I was playing about an hour-and-a-half before kick-off,” revealed Collin. “I was disappointed not to play at Elland Road. To play at one of the best grounds in the world will be brilliant. The Heroes cheerleaders strutted their stuff pre-match to the strains of “I’ve got a feeling tonight’s going to be a good, good night” and the confidence proved well founded in front of easily Carlisle’s biggest crowd this season – but only just. Two years ago, faced with an identical position in the League One play-off semi-finals, some of that Carlisle team felt they had been too content to sit on their lead, but they took the game to Leeds in last night’s first half. Evan Horwood and Danny Livesey had chances in the first eight minutes but the game soon became scrappy, punctuated by referee Andy Hall’s intolerance of the Leeds centre-backs’ over-physical treatment of Scott Dobie. Dobie’s graft as the lone striker was rewarded in the 33rd minute when he helped the ball on under pressure from two defenders. One-on-one with Casper Ankergren, youngster Adam Clayton kept his cool. If Gary McSheffrey –– like Manchester City’s Clayton on loan from the Premier League – had shown similar composure two minutes later, Leeds would have quickly levelled. The complexion of the game changed within 40 seconds of its restart. 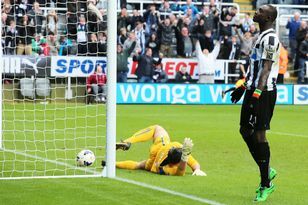 First Max Gradel forced a two-handed save from Collin, then Robert Snodgrass nodded an equaliser. Now Carlisle were on the backfoot and Max Gradel had a 64th-minute header disallowed. Kevan Hurst’s breakaway settled some nerves with 18 minutes to go, only for Jason Crowe’s equaliser to stir them up again. Mike Grella’s 86th-minute header from McSheffrey’s cross shredded them, setting up as penalty shoot-out Carlisle must have thought Hurst had spared them. It took 14 penalties, but Collin’s save from the last of them booked Carlisle’s fifth Football Trophy final in 15 years. Carlisle’s elation was overshadowed by a post-match pitch invasion in which Leeds boss Simon Grayson claimed three of his players had been punched. There were also allegations of a laser being shined at the visiting penalty-takers. “The stewards have done nothing about it which is wrong,” he said. “Anything could have happened and I will be taking this further. CARLISLE: Collin, Keogh, Livesey, Harte, Horwood, Hurst, Thirlwell, Kavanagh (Taiwo 74), Clayton, Robson, Dobie (Madine 79). Subs not used): Pidgeley, Murphy, Offiong. Booked: Keogh. Goals: Clayton 33, Hurst 72. LEEDS: Ankergren, Crowe, Naylor (Grella 79), Michalik, Lowry, Snodgrass, Howson (Kilkenny 66), Doyle (Johnson 66), McSheffrey, Gradel, Becchio. Subs (not used): David Martin, Bromby. Goals: Snodgrass 46, Crowe 80, Grella 86. Steve Bruce has thick skin but even he can be stung by spiky criticism. SUNDERLAND need a win at Portsmouth to exorcise the demons from their nightmare at Chelsea.